Not too long ago, I had the sudden realization that my son was big enough to take out the trash. On the heels of that thought, came the idea that perhaps all the work I do around the house can be somewhat mitigated by delegating tasks to my children. Chores! I have no idea why it took me so long to come to this conclusion. Perhaps it;s because the one “chore” I did assign them—keep their room clean—seems to elude them at every turn. I’m sure my mother is cackling on the other end of the phone when she hears me tell them to “clean your room, for Pete’s sake!” while I mutter to her I must have asked them a hundred times. She’s probably remembering the times she said the same thing. If nothing else, she taught me to keep a clean house, so there is hope for my two. But that is probably why I didn’t think to assign them larger chores. It started with the trash and continued to putting away the groceries. Granted, the trade off is that I’m not sure where any of my food is, but since I know I bought it, I do eventually find it. Now it’s at the point that as soon as I get home with a bag of groceries, the kids instantly empty it. If only they’d be as pro-active with pulling weeds. It appears no one in my house enjoys that little chore. Still, their list now includes feeding the fish, taking out the trash, putting away groceries, and watering the garden, which, by the way, perfectly coincides with bath time. 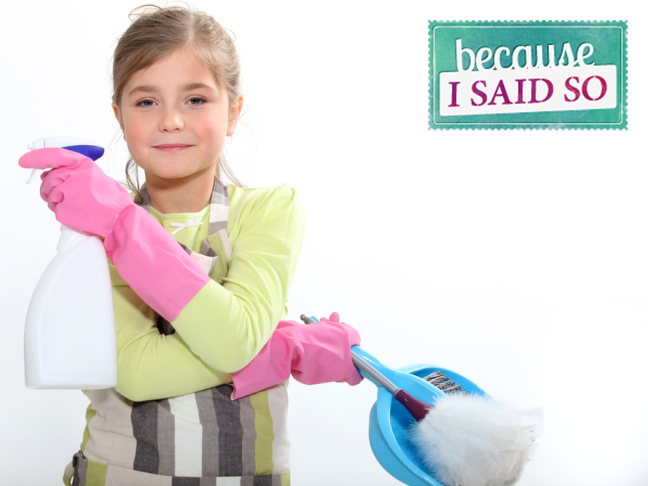 How old were your kids when you started to assign chores?